There are a number of things that are unique about living in Evergreen and Conifer. Mountain living is like no other kind of living in the world. There are countless reasons why being able to live this lifestyle is such an enjoyable one. However, there are also factors that need to be taken into consideration, in order to adapt. One of those elements is the fact that gas fueled heating systems operate differently in higher elevations. So whether you are new to the area or have lived here all of your life, here are a few things you should know about altitude and gas heating systems. Your heating system may technically work at higher altitudes, but it needs adjustments in order to operate the way it should. So, for instance, to function properly at higher elevations, natural gas and propane Btu inputs need to be altered accordingly. If not set properly, this will result in overfiring. This will lead to overheating or shortcycling. Aside from just reducing the efficiency of a unit, a system that overfires poses safety concerns. That is because it can lead to improper burning, and incomplete combustion can result in excessive production of carbon monoxide. At altitude, gas fireplaces and furnaces are often susceptible to different issues resulting from gas derating. 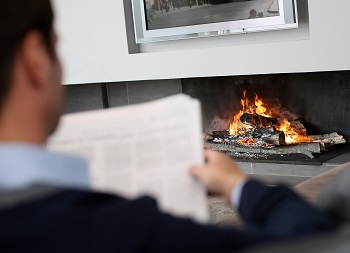 Gas fireplaces and furnaces in higher elevation settings may be prone to issues linked to burning and pressure due to the fact that the air is thinner. So this means there is less oxygen readily available for the combustion process. All of this means that you should only partner with a heating contractor who has the training and experience required to better understand how altitude impacts your heating system. For the best in the business, call on Ponderosa Heating and Air-Conditioning to get the job done. Do you need service for a gas fireplace or furnace in Evergreen and Conifer, CO? Call 720-470-1133 or complete our online request form.